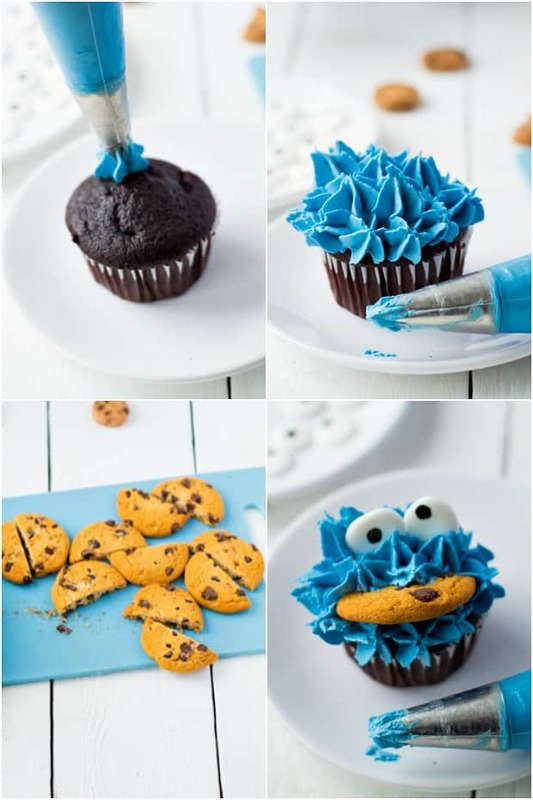 These cute cookie monster cupcakes would be perfect at a Sesame Street birthday party! They are made from scratch BUT this recipe is super fun and easy to make. 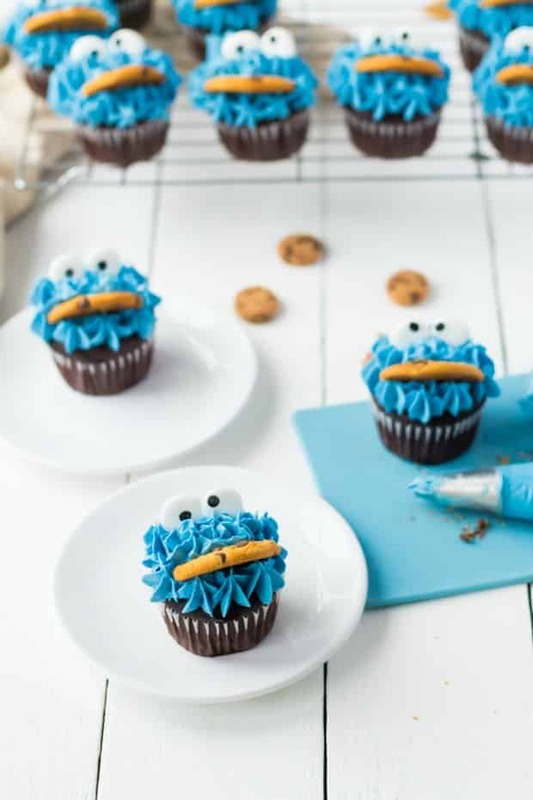 Your own little cookie monsters will be ecstatic over these cupcakes. 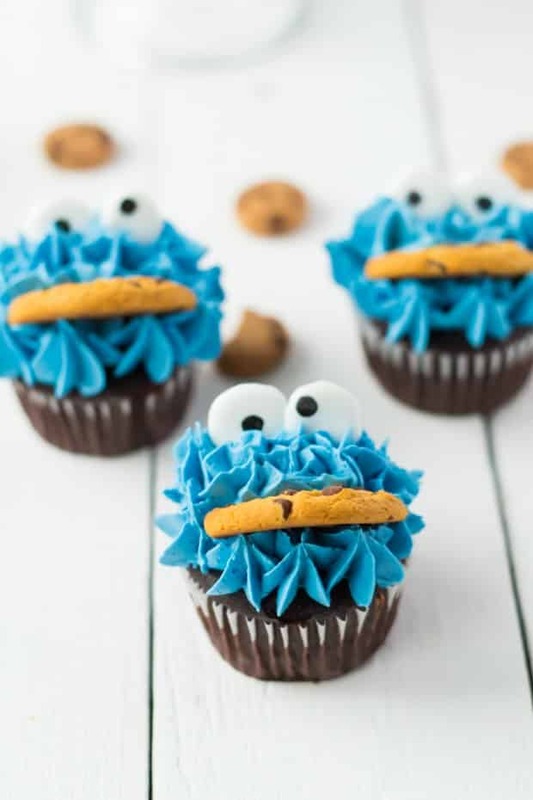 The kids had a blast taking the cookies out of his mouth and going, “Me want cookie!” No one can resist smiling when these funny cupcakes are around. 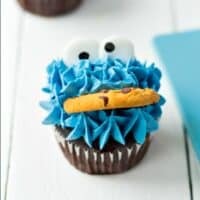 This treat would go great with our easy to make cookie monster ice cream. Don’t let these cupcakes intimidate you. 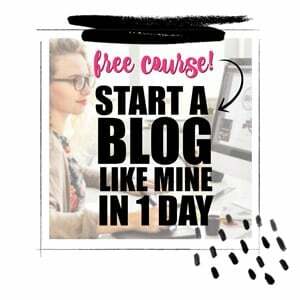 It’s simple to DIY at home with these step-by-step instructions. First, preheat the oven to 350 degrees and add paper baking cups to the cupcake pan. Black or blue are great colors for this recipe. Mix all the dry ingredients like the flour, sugar, cocoa, baking soda, baking powder, and salt in a bowl. In a separate bowl, add the eggs, whole milk, oil, and vanilla extract. Pour them into the bowl that has the dry ingredients. Mix all together until fully combined. Beat for 3 minutes on medium. Slowly add boiling water, only starting with a small amount then pouring in the rest. It’s okay if the batter is a little runny. Scoop the batter into the lined baking cups until 3/4 filled. You want to make sure you have enough batter to get a nice dome at the top. Bake for 20-25 minutes. When the timer goes off, remove cupcakes from the oven and use a toothpick to check if they’re done. Allow them to cool for 10 minutes. 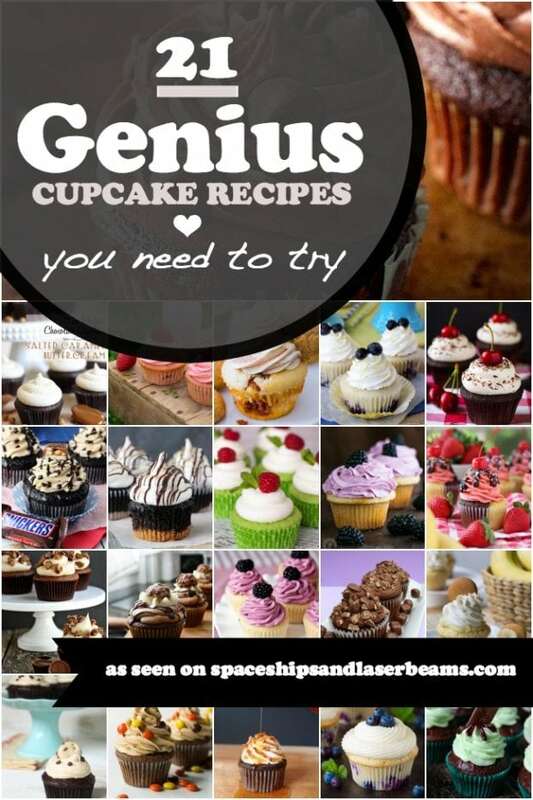 Carefully take them all out of the cupcake pan and place the cupcakes on a wire rack until completely cooled. If you try to decorate too soon, things will get messy fast. Now on to the fun part — decorating! For the buttercream frosting, cream the butter and powdered sugar by mixing the soft butter and sugar until it looks light and creamy. It should look like a fluffy, light yellowy mix. Add the heavy whipping cream. If it’s doesn’t cream, add several drops of heavy whipping cream until it’s creamed properly. Don’t over mix because you want to create air pockets in the dough. Add just a small amount of gel food coloring to get that royal blue color. Check to see if the frosting can hold a stiff peak by taking a spoonful of frosting and turning the spoon upside down. If the frosting stays on the spoon, it’s ready. If not, then add more powdered sugar, about a 1/2 cup at a time. Mix well. When the frosting is ready, scoop the frosting into a pastry bag with a large star tip. Push the frosting to the tip by twisting the open end of the pastry bag. As you get ready to frost, hold the bag straight up and down and start frosting the cupcake straight up and down. Next, place the candy eyes. I like to put one of the eyes higher to make him look googly eyed, just like cookie monster’s signature look. For his mouth, break or cut a chocolate chip cookie in half. You can make a batch of cookies from scratch or buy some. Stick it right into the frosting, as though the cookie is sticking out of his mouth. If it doesn’t stay, you may have to use a sharp knife to make a cut in the middle of the cupcake and wedge in the cookie. And look at that — you nailed it. I’d say a cupcake eating a cookie is the best kind of cupcake. Mr. Cookie Monster would approve. Be sure to do your best impression of Cookie before you gobble him up. Add the eggs, whole milk, oil, and vanilla to the bowl holding the dry ingredients. Slowly add the boiling water, starting with a small amount then pouring in the remaining boiling water. Scoop batter into cupcake lined cups until 3/4 filled. 11. Remove from oven and allow to cool for 10 minutes. 12. Take out of the cupcake pan placing on a wire rack until completely cooled. Cream the butter and powdered sugar until it looks light and creamy. Add more powder sugar 1/2 cup at a time. Mix well. When ready, scoop the frosting into a pastry bag with a large star tip. Holding the bag straight up and down, frost the cupcake straight up and down. Place 2 large candy eyes on top of the frosted cupcake. Stick the cookie in the middle of the frosted cupcake as though it is sticking out of his mouth. 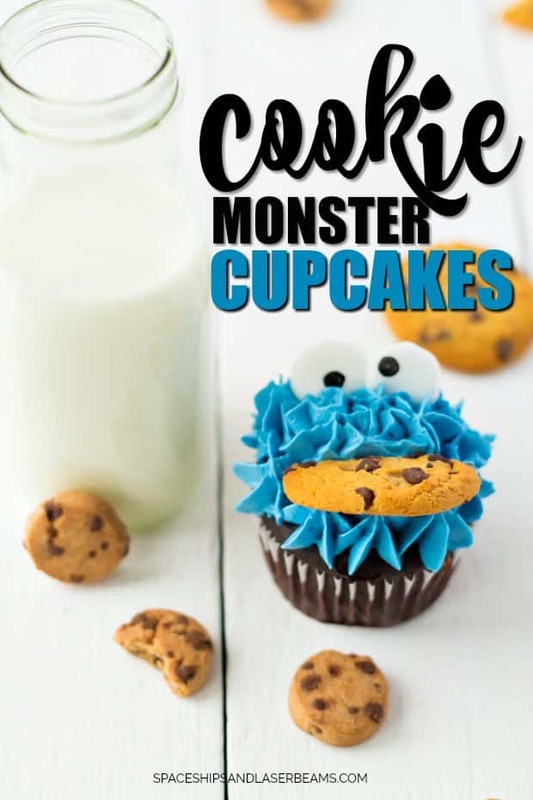 Really great cupcake recipe and fun activity with my kids!